If there's one thing that drives me nutty when it comes to selling food, it's when companies advertise something they are not truly delivering. They aren't breaking the law, because you can always find out the real story through the ingredient list and the nutrition facts table....but it's still a poopy practice that makes me crazy. Case in point - companies that sell products with fruit on the package, but no fruit *in* the package. Baked goods are one of the WORST offenders for these. 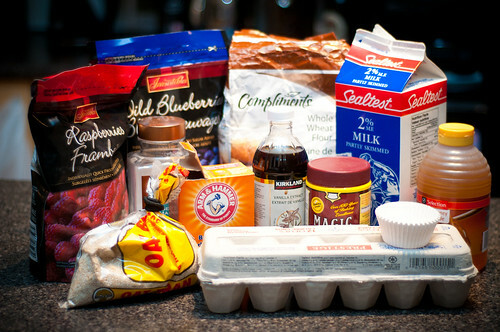 For example, take this blueberry muffin mix - if you click the link and read the label....it does not contain any actual blueberries (although it does contain delicious-sounding artificial blueberry flavor bits, which themselves contain sugar, oil, artificial flavour and 2 different artificial colours). Blech. No thanks. 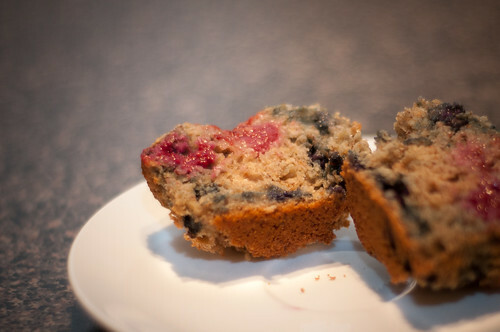 These triple berry muffins are just as bad - containing the similarly appetizing imitation berry bits. As an alternate example, there are those products that DO contain real fruit....just not so much the fruit that's being promoted. This one actually peeved me, because it's a product I've purchased before (as you can imagine, I don't buy muffin mix, so I haven't fallen for the tactics above....that said, if any of you ever buy cake mix, before the carrot and banana nut cake....they probably don't contain carrots or bananas....always read the label....or google a recipe and make your own cake). The example above, while enlightening, don't really irritate me THAT much, because I don't think anyone really expects packaged muffin and cake mixes to be healthy, wholesome foods. But when I buy an unsweetened applesauce product, labelled with a flavour....I do think it's reasonable to expect that the flavour labelled on the outside matches the ingredients that make up the product within. Mott's Fruitsations is a brand of applesauce product that advertises itself as unsweetened, boasts the Heart and Stroke Foundation's Health Check label and in general, would like you to think that your Raspberry, Cherry, Starfruit puree is as pure and untainted as unicorn poop. Except check out the ingredient list: apples, water, concentrated apple puree, vegetable juice concentrate for colour (black carrot), natural flavour, concentrated raspberry puree, ascorbic acid. So um....I don't see any starfruit on that label. I don't see any cherry on that label. I do see black carrot juice for colour, though since the end product does not taste like carrot, I can only imagine that the tiny amounts of "natural flavour" and "concentrated raspberry puree" are the source of the berry deliciousness of this snack. And it is pretty delicious, not gonna lie. But I still feel that it's misleading to be a supposedly healthy product with these supposedly natural ingredients, and it turns out that the flavour is not, in fact, coming from the ingredient, but from some 'natural flavour' that is likely INCREDIBLY far processed from an actual fruit. Don't even get me started on things like granola bars. Cereal bars (like the jam-filled Nutri-Grain bars) are some of the worst offenders over-promoting ingredients that barely make an appearance. My favourite? The cherry-pomegranate one. 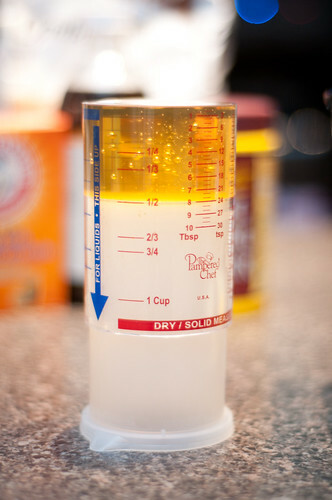 Ingredients for the filling are as follows: invert sugar, corn syrup, water, glycerin, cherry puree concentrate, sugar, modified corn starch, pomegranate juice concentrate, sodium alginate, sodium citrate, natural and artificial flavor, malic acid, citric acid, methylcellulose, dicalcium phosphate, caramel color, red #40. I love how they advertise it as full of antioxidants, but I mostly see a bunch of sugar, gelling agents, additives I don't really understand, marginal amounts of concentrate fruit [which is also essentially sugar], flavours (both natural and artificial) and two different artificial colours. Again...blech. Do yourself a favour and buy a pomegranate and some cherries. Eat them with oatmeal. You'll be much better off. It's not complicated to make (I've added a bit of complication, but not too much, I swear! 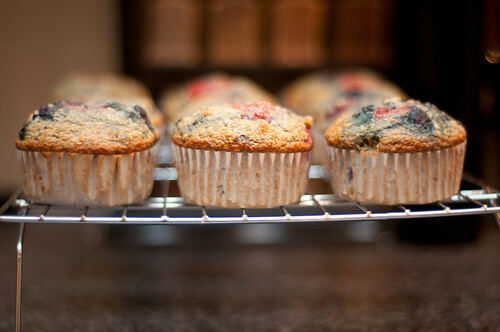 And it's totally optional) and the end result is a muffin that you can feel relatively good about. You can pronounce all the ingredients, it's made with whole grains, it's not AS sweet as a purchased muffin, and it's got real fruit. 1. Preheat oven to 350F. Line tins with paper. Get all your ingredients together. Except forget a few, and then get them out after. 2. 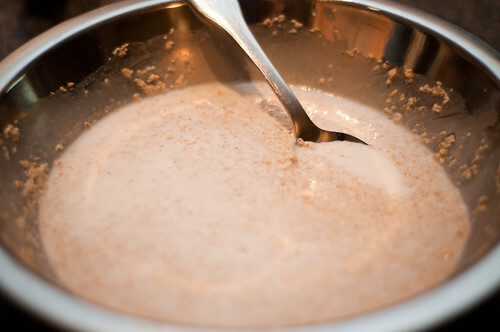 Mix together bran and milk. Let stand 10 minutes. 3. In a large bowl, mix applesauce, egg, honey and vanilla. 4. 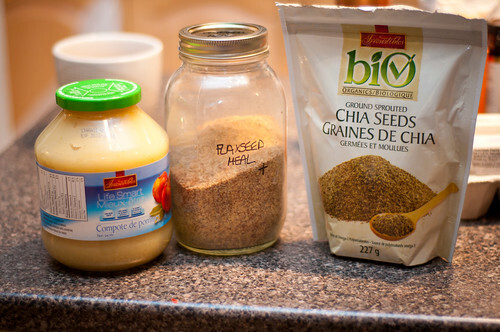 In a small bowl, stir together flour, baking soda, baking powder, salt, chia and flax seeds. Again, the seeds are optional - if you have 'em, go for it, but they aren't necessary. 5. Add the flour mixture to the wet ingredients. Give it a quick stir. Add the bran, stir just a few more times (lumps are fine...remember, the more you stir a muffin batter, the more your muffins will resemble hockey pucks. Be gentle). 6. 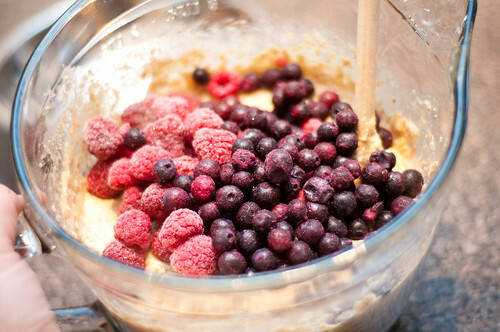 Stir in raspberries and blueberries. Gently spoon into 12 muffin cups. 7. 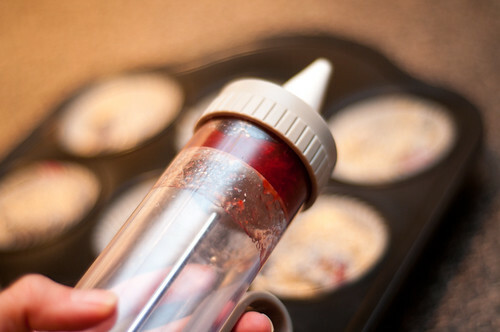 OPTIONAL: Using a piping bag (or icing gun), gently poke about 1 teaspoon of jam into the centre of each muffin. I use an icing gun with a plain small round tip. I added a bit more on top, because I still had a loaded icing gun. :) It does up the sugar content but it's a nice little surprise. 8. Bake for 15-20 minutes. Once the jam is bubbling and oozing a bit, they are done. 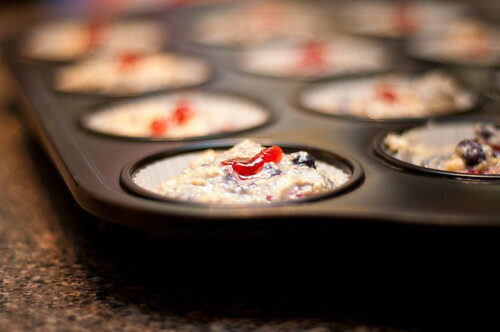 Let them sit in the muffin tin for about 5 minutes (especially if you haven't used paper...lower-fat muffins do tend to stick a bit!). 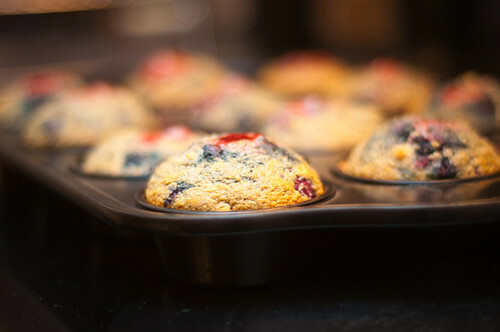 These muffins are delicious....when you look at the ingredients, you can tell they are pretty healthy, but when you taste them, you just get to enjoy the delicious summery tang of real berries, just a hint of sweetness and a whole lot of whole grain goodness. NOTE: I have also made these muffins omitting the berries and jam, and using dark chocolate chips. They were awesome. Also worth trying. Hope you enjoy! And don't forget to check me out on Facebook! Great muffin recipe!! I can't wait to try this at home with my son. He loves muffins. I agree with the whole false advertising thing. It's terrible; you really do need to read the labels to know exactly what you are buying AND you have to do adequate research to understand what you are eating. I think in general, consumers need to use more common sense too. If you bite into a cereal bar and it tastes sweeter than any fruits you've ever eaten, the chances are, the bar has more sugar than fruits. Same goes for juice, etc. I think it's fine if you want to buy that kind of stuff; I'm often guilty of that. But don't lie to yourself and say, "Oh! Cereal Fruit Bars - it's got grains and fruits. It must be good for me." I think it's ok to eat it (once in awhile) as long as you are honest and know that this is a treat, then you can compensate for the badness elsewhere in your diet. Mmm! I love muffins, especially muffins chocked full of scrumptious stuff like this. Looks scrumptious. This muffins looks simply delicious. I think it is indeed what the doctor ordered if you are in need of comfort food. I can’t wait to try creating this at home. Your muffins truly is the best. 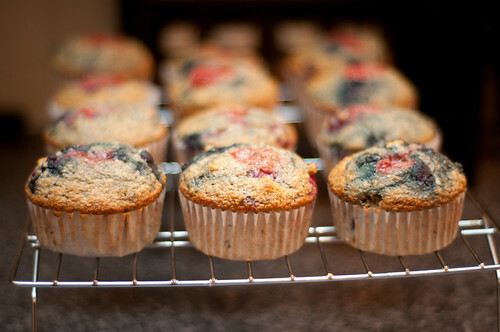 I love the colors in the muffins from the berries and I'm pretty sure my daughter would too! And I so agree with the boxed foods... we really have to pay attention to what we choose!